These two 27 storey (313 suites in each) Art Deco-styled glass-and-steel towers are topped with crowns in striking green and blue, with reflective solar panels to help generate energy – just one example of many environmentally friendly initiatives of the developer Amexon Development Copr. Constructed with luxury in mind, this project has open concept living spaces, 9′ ceilings, granite kitchen countertops, engineered hardwood flooring, floor-to-ceiling windows, and much more. Suites range in size from 454 sq ft to 2170 sq ft. Amenities include the ocean drive lounge, the shore club, spa, guest suite, gym, party room, sauna, and swimming pool. 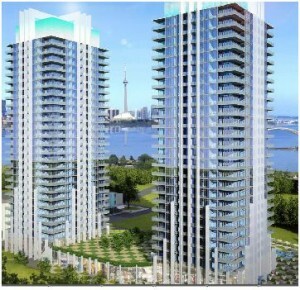 >>Click here to contact me if you are interested in viewing units in this development, or any other Toronto condo or loft development.